The Mint Pavilion was conceived of as a temporary structure to house a traveling exhibition by a high profile contemporary artist(s) that celebrated the opening of the newly constructed Mint Museum of Art in Charlotte, North Carolina. Proposed to open in October 2010, this project assumed that the Mint was looking to build public interest by featuring a special collection in a very public location prior to the opening of the new building. 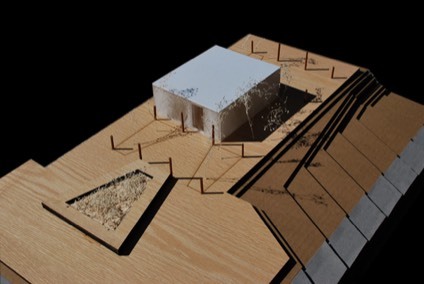 The project brief stated that The Mint Pavilion was intended to be featured in its uptown site from May 7, 2010 until May 23, 2010 and was intended to be erected and dismantled overnight, making ideas of prefabrication a must. The art then was to be placed within the pavilion one-piece per day for 10 days (10 pieces of art total) creating a theatrical scene and holding the public interest over an extended period of time. A simple, paired down program, the pavilion simply housed the ten pieces of art and handled an appropriately sized crowd of people. Utilizing precedents such as M.C. Escher, Islamic tiling, Karakusa and Voronoi. The algorithmically controlled geometric parameters served as the design generator for pavilion. These patterning strategies proved fruitful in the exercise as, in many cases, the moved beyond surface articulation and toward a systematic approach to design and more importantly to fabrication.